Almost everyone is guilty of making a few interior design mistakes—and they're often the same ones. People fall in love with furniture that doesn't fit, slap on the wrong paint colour and have walls full of holes from where they've hung the wrong picture. And for those who love experimenting or creating eclectic looks, it's even easier to get caught up in a few decorating misadventures. But all this can be avoided! While many of us know what colours and pieces we love, it takes a knowledgeable eye to understand how colour, balance and light affect a design. There's a skill to interior decorating and it helps to educate yourself. So, come with us to explore a few key elements of interior design. It might just help avoid a decorating disaster! If you're feeling a little overwhelmed by all the options and styles, take a little time out and consider an outside perspective. A trusted friend might point out something completely obvious you may have never considered before. Perhaps you could even engage the services of an interior decorator. A professional will be familiar with all the usual traps and the best ones will know where to get the best furnishings in your area. This particular stunning entranceway has been created by Singaporean interior designers imagine by SK66. Our living rooms are often the most common areas we use to entertain others. 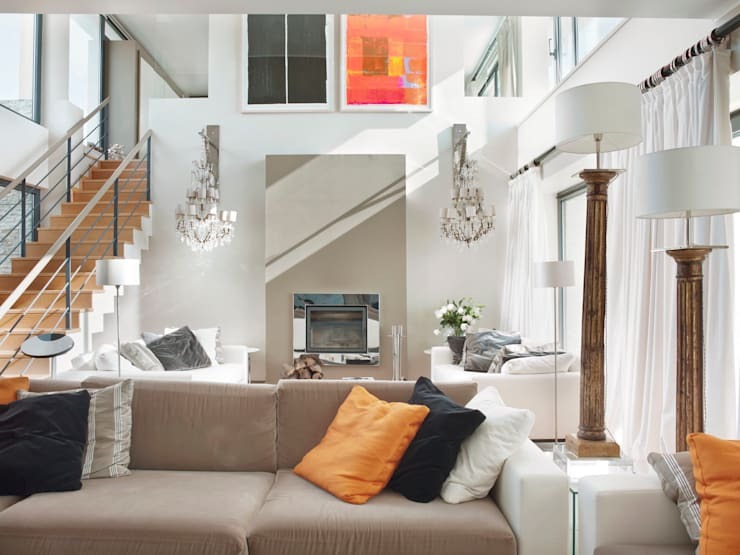 This tends to encourage us to think of a living room as a showpiece. So we place everything we love in this one room and neglect the other rooms—most importantly the bedroom! 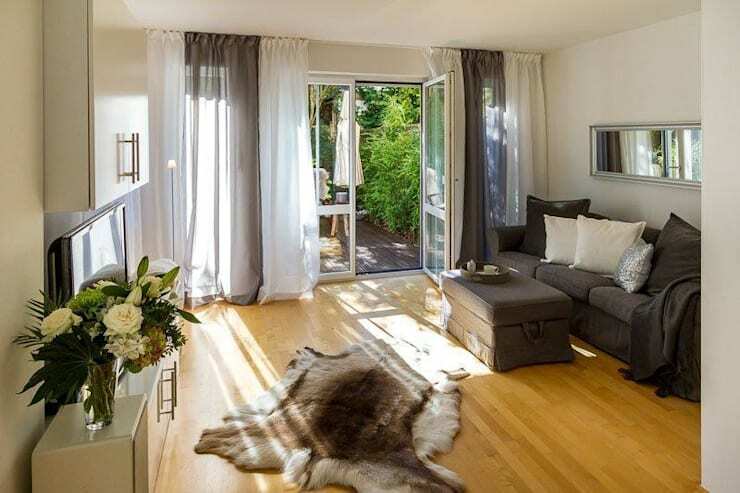 Look at shifting some of your favourite pieces of furniture or accessories into this space. Be careful though to consider the effect they will have on your sleeping habits. The best bedrooms are places of serenity, so it's best to avoid anything too stimulating or stressful. Note here how this simple reading area has been created with a lovely comfy plush rug. Disproportionate or unimaginative scale is perhaps one of the most typical interior decorating mistakes. Consider the overall scale of the furnishings. It's common to either clutter your space with lots of small items, or go in the other direction with lots of bulky items. A room should be filled with items with a variety of heights and shapes. This will make the room feel larger, more interesting and balanced. Finally, furniture that's too large or small has a radical effect on the feel of a room. It might even be so bad that furniture legs get in the way of easy access. But choosing the right scale is not simply a matter of measuring your space. Look at blocking out the space for a new table or item of furniture with some tape. It's even better to use large pieces of paper. Calculate the space needed for chairs and common walkways, so you can buy your furniture with confidence. Every great design needs a focal point and your home is no different. Look at each room and decide on its primary function, then build your focus around that. For example, a living room is often dominated by a television, but it doesn't have to be this way. Perhaps the living room is often used to connect with people. In this instance, you might arrange your seating to face each other and make a central coffee table the focus of your decorations. Also, don't forget the power of a well placed artwork. 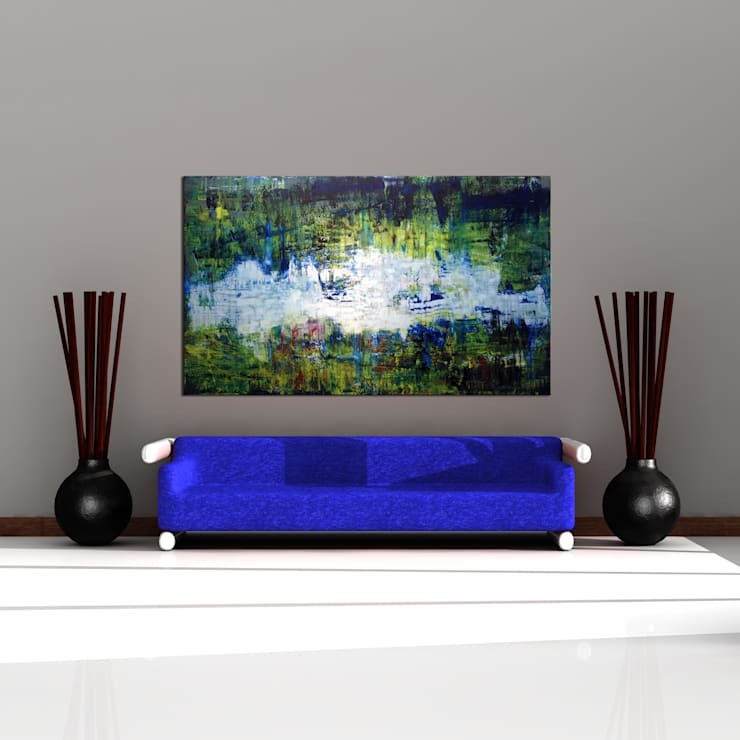 A beautiful artwork like this one by German artist Buntfarben provides a place for the eye to rest and helps give the living room cohesion and balance. There's a simple, instinctive pleasure in changing the colour of your walls. But it's easy to tackle this first and think of the rugs, curtains, cushions and textiles second. You should actually approach things the other way around. It's easy to find paint colour we love, but far trickier to find a textile that suits. Take the time to find the right textiles then choose your paints—your paint colour might take a different direction than you had anticipated anyway. Look at this lovely blue-grey room. The designer might have chosen a wall colour that reflects the creamy floral pattern here with equally stunning results. Mixing and matching can be a little scary at first, but there's nothing worse than buying everything from the one store. Everything will look too matchy-matchy and lack the homeliness that makes a house a home. Measure out your space, decide on a budget and take the time to shop around. Then you can start thinking about how to mix and match. All you need is one or two common colours or textures to create a sense of cohesion within the space. A home with a distinctive personal style and character is built over time. It's not something that can be rushed. Lots of people tend to sprinkle a little bit of their loved objects and personal collections all over a home. While these items are a very important part of your personal style, this kind of habit can often make a home feel cluttered and messy. Personal collections are precious. Gather them into a collection and give them pride of place in the room. Perhaps you can display them on some lovely shelves and light them up to create a dramatic effect. 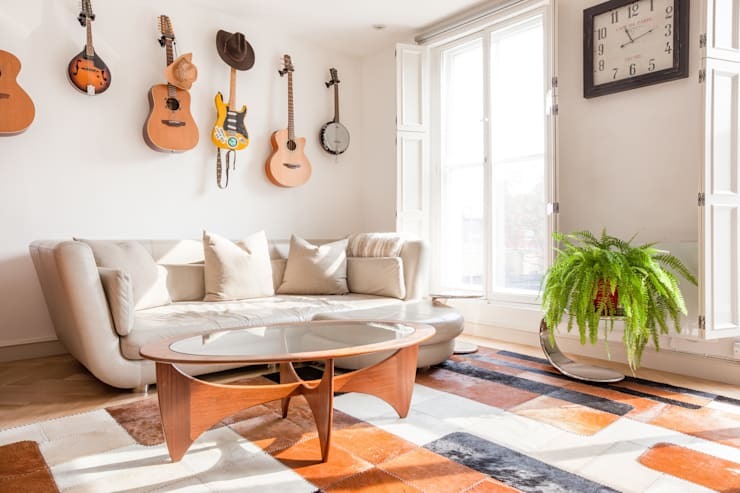 If you have some lovely musical instruments, perhaps you just hang them on the wall like this. 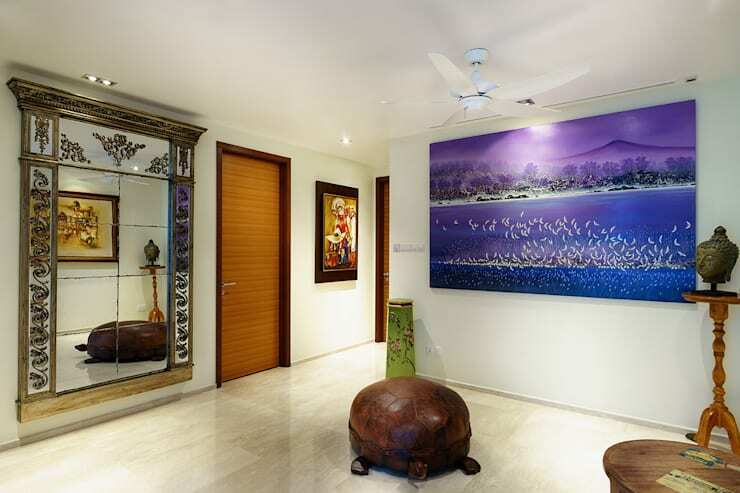 Artwork is an integral part of most home decors. But it's very easy to choose a spot on the wall without really considering how it will affect the visual balance in the room. Once the holes have been drilled or the super adhesive hooks have been hung, it's hard to start over again. Most people hang their artwork too high on the wall. The safest approach is to measure 145 centimetres from the bottom of the floor and make a mark on the wall. This is the average eye height of most people and the dead centre of your artwork should sit at this point. If you are arranging a wall collection, place your most prominent pieces at this height and work your way outwards. It is often helpful to cut out pieces of paper in the shape of the artworks and tack/arrange them to the walls until you find an arrangement that feels balanced. 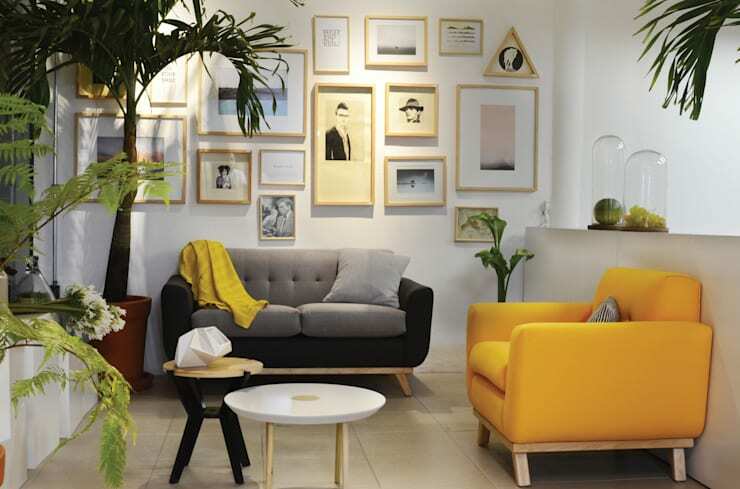 If you're still in decorating mode, you'll need our Update Your Living Room in 6 Easy Steps Ideabook for more tips! What do you think of these decorating tips? Have you had any decor disasters? Let us know in the comments!